2 of these 4 Xbox games don’t cause seizures! First-person shooter game Halo: The Master Chief Collection was one of the recommended Xbox titles with a higher seizure risk. Half of the Xbox-exclusive games selected by GamesBeat for its 2014 holiday gaming guide appear to be free of seizure-provoking visuals. There were just 4 Xbox games in the buying guide, so we’re talking about exactly 2 games that meet seizure safety guidelines. I don’t know how representative this sample is of the universe of Xbox-exclusive titles. Disney Fantasia: Music Evolved isn’t a game in the conventional sense; it’s a rhythm game played by the motion of the player’s arms, enabled by the motion-sensing Kinect controller. There are no battle scenes that might set off visually risky explosions, or races with crashes and fast-moving scenery. Instead, when players “conduct” to the beat of music selections, all sorts of colored patterns are created and set in motion on the screen. It’s visually interesting yet not overstimulating. There’s a lot of black space separating the smaller colorful elements. Sunset Overdrive, released by Microsoft Studios, is a third-person shooter game, a relatively low risk genre, seizure-wise. 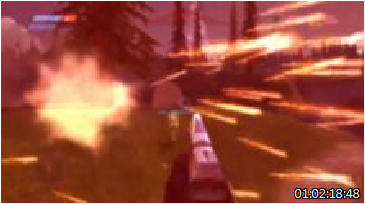 Because these games tell a story from the perspective of an observer of the action, scenes are shown from a wide angle. This means that, unlike first-person shooters, any bright, explosive flashes and rapidly swirling debris don’t dominate the field of view. The larger the screen area of patterns flashing images, the higher the likelihood is that those visual effects might provoke a seizure. The Halo image at the start of this post is shown here in the upper left of a screen from the seizure safety testing application. 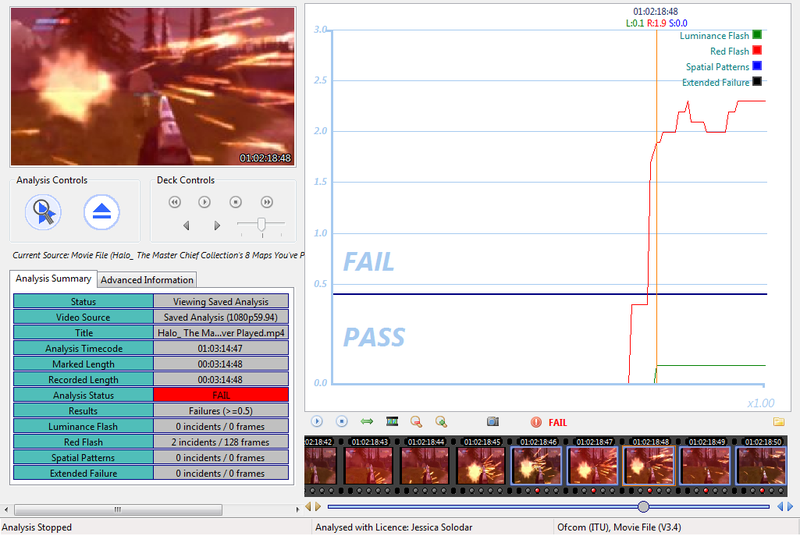 The image occurs in a stretch of gunfire with flash levels exceeding seizure safety guidelines, as shown by the red line on the graph. So it’s not surprising that first-person shooter Halo: The Master Chief Collection contains seizure-provoking images. Its predecessor Halo 4, which I tested 2 years ago along with other FPS games, failed the flash and pattern analyzer test, too. Not so surprising, either, that the racing game Forza Horizon 2 violated seizure safety guidelines. 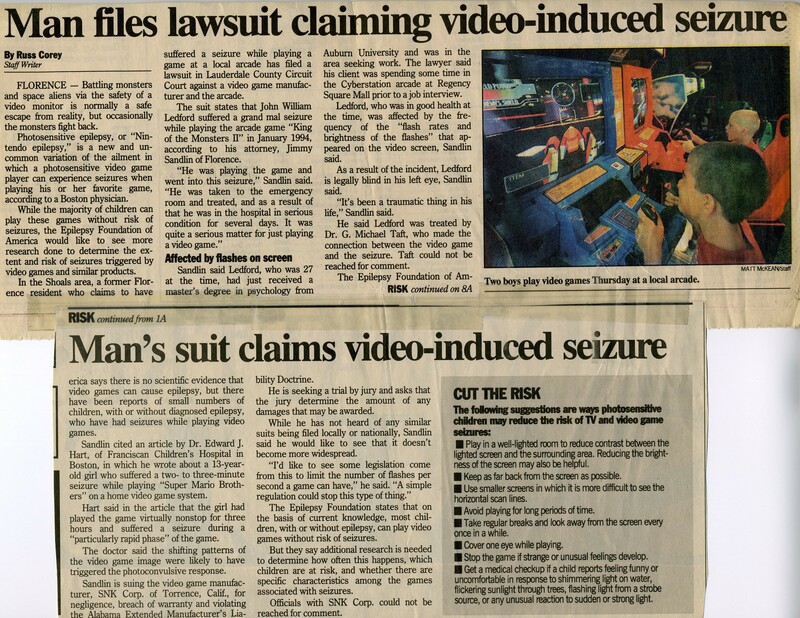 As I’ve previously found, the quick cuts, fast-moving scenery, and dramatic collisions featured in the racing genre result in games that exceed or approach seizure safety guidelines. The original version of the game, which I tested nearly a year ago, contained a lot of scenes that flirted with safety guidelines limits, but I didn’t find actual violations. This completes my seizure risk assessment of games chosen for GamesBeat’s 2014 holiday gift guide. In recent posts I’ve reported on the risk of seizures in the guide’s recommended multiplatform games and games exclusive to Nintendo, Sony, and PCs. After testing all 43 games in the GamesBeat 2014 holiday guide, it appears that 26 titles–60 percent–contain image sequences capable of provoking seizures. Just 40 percent of games recommended in the GamesBeat holiday guide complied with seizure safety guidelines. These are supposed to be the industry’s best games–how often is higher seizure risk is associated with the worst games? Or the not-especially-noteworthy? If I had unlimited time and testing resources, we could find out. Consumers deserve to see reviewers rate games for seizure risk, not just for graphics quality, speed/performance, modes of play, characters’ personalities, levels of difficulty, modes of play, frame rate, music, and so on. Please remember that your results could vary. Games that pass the seizure guidelines test could have seizure-provoking sequences that I was unable to locate. I don’t do this testing while actually playing these video games and I don’t see all the scenes. Instead I work with video clips available online, some of which are official marketing and gameplay trailers and cutscenes; others are gameplay sessions posted by reviewers or fans. I do not test fans’ gameplay clips if the original game was modified with other software. In addition, the seizure threshold of individuals is affected by a number of factors including illness, hunger, stress, fatigue, length of play, and menstrual cycle, among others. So a game that seems OK may subsequently trigger a seizure under different conditions. If the first clip I test of a game fails the safety test, I move on to test the next game. I typically test at least 4 or 5 additional clips of a game if no violations are found initially. If I have a high level of suspicion due to the game genre and/or overall look of the sequences that there might be unsafe “footage” that I haven’t yet found, I may test a lot more clips.